This past Friday I was scheduled for an ultrasound to check out what might be causing the stomach and back pain I was having last week. Luckily the hospital I was scheduled at is in one of my favorite small towns out this way, Silverton, Oregon. I love driving through Silverton, the drive is beautiful countryside the whole way, then the town itself is full of very pretty houses from the early 1900's, as well as very interesting shops. The rule in our house is, that any time you have to go to the hospital or doctor for something, you get to go somewhere fun afterward, that way there is something to look forward to. 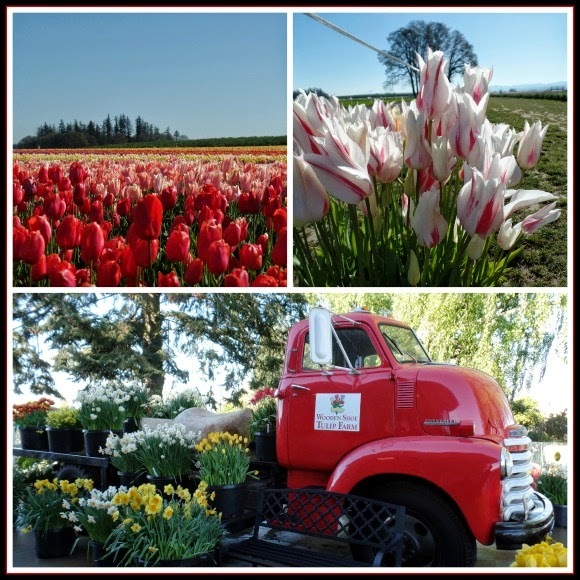 Originally I was planning on stopping in at some of Silverton's antique shops, but the weather was so nice we decided to drive over to Woodburn for the Wooden Shoe Tulip Festival, and boy am I glad we went! We arrived at the tulip farm bright and early, just as they were opening, which was nice, because it wasn't too hot, and there were hardly any other people out in the fields. 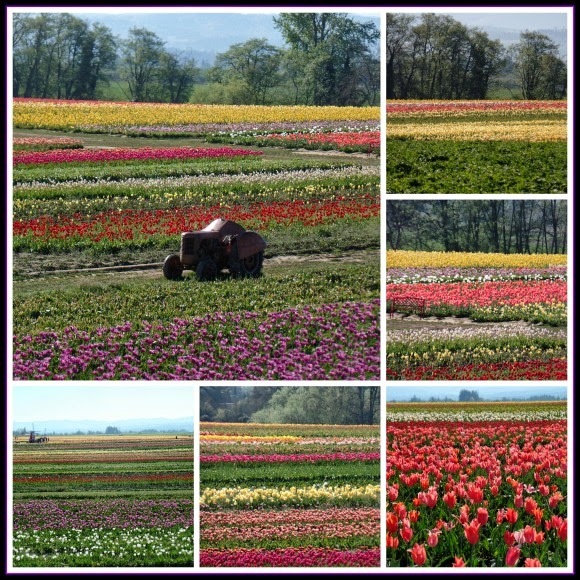 I was immediately awestruck by the gorgeous fields of tulips in every color. 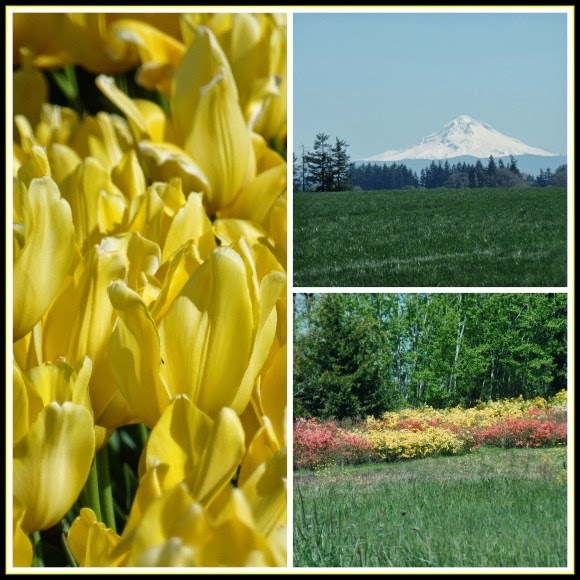 The tulip fields are surrounded by our beautiful Pacific Northwest scenery, lots of fir trees, and a beautiful countryside setting. 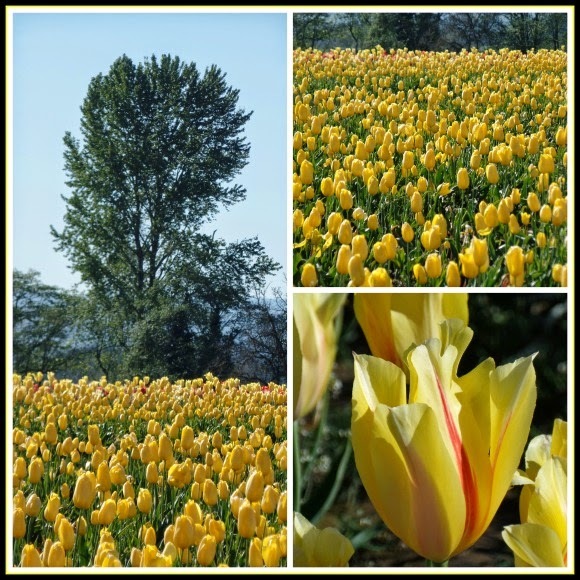 I loved these yellow tulips in front of the fir trees. The peach and pink tulips were so pretty. Tulips happen to be the flower I most often choose for my vases at home, I love their vibrant colors, so seeing this many of them was something else! In addition to individual sections of all one color there was also a field planted with a variety of colors, one section was even a You-Pick area, and as more people arrived some were out in the fields picking a bunch. 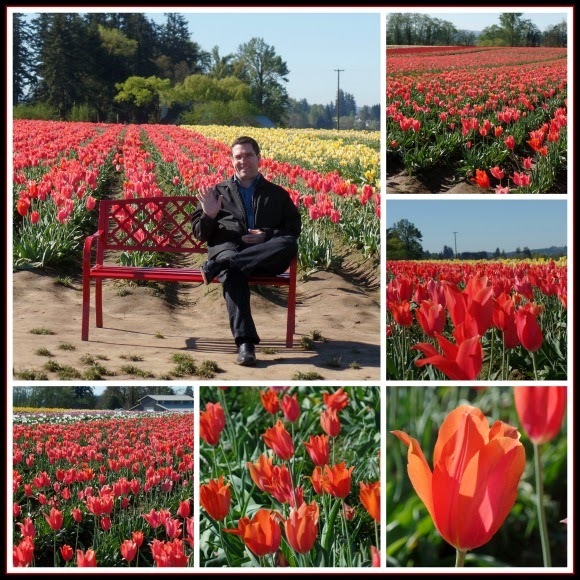 Here is a picture of Gary sitting in front of my favorite tulip of the day, it was a vibrant coral red color, and I may have to order some of the bulbs if they still have any left. People are welcome to bring their dogs, so there were plenty of well behaved and very cute dogs exploring with their owners. 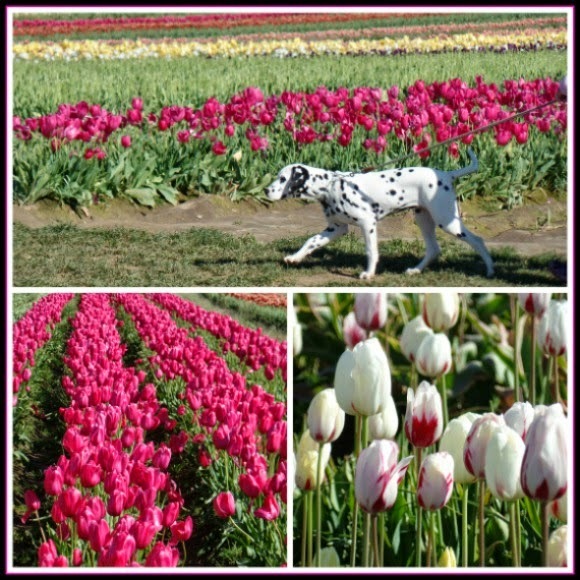 This little Dalmatian looked so cute in front of the pink tulips. I love dogs, they were all so cute, and really seemed to be enjoying the visit just as much as their people. The festival has a drinking station set up for dogs and everything. 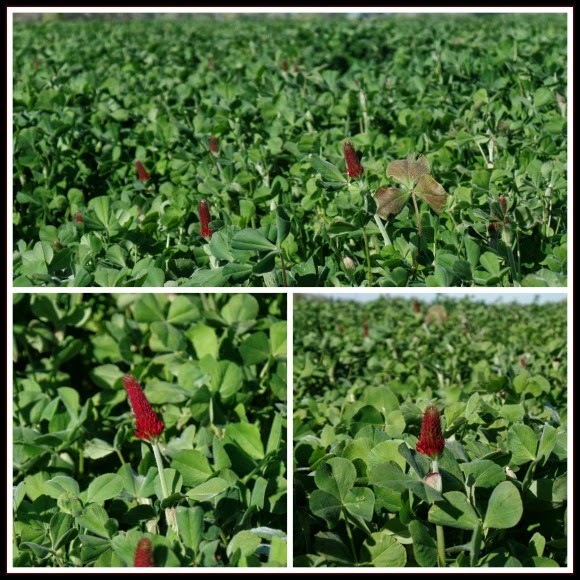 There are other things growing around the farm as well, this field of red clover was particularly pretty, I hadn't seen this variety of clover before, I loved the bright red flowers! When lunch time rolled around we knew just what we were going to have, the Mt. Angel Sausage Co. had a stand there, and we love their Bratwurst! We have their sausages every year at Oktoberfest in the neighboring town of Mt. Angel (you can read about our Oktoberfest adventures here and here). 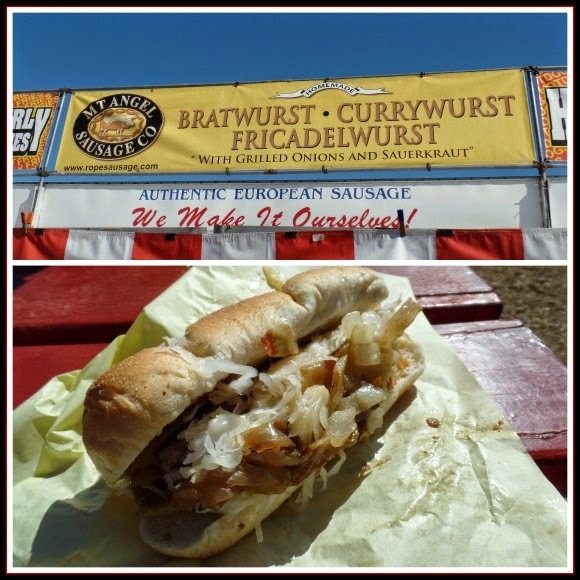 The sausages are delicious, topped with sauerkraut and grilled onions! 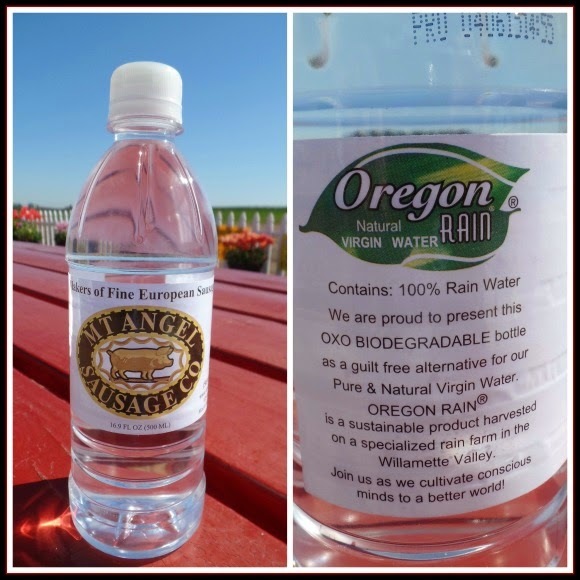 The weather had started to warm up by lunch time as well and we definitely needed some water, I thought it was really neat to see that the water was natural Oregon rain water harvested on a rain farm in Willamette Valley, it was a nice water. After lunch we explored some of the old tractors on display, they were pretty cool, Gary really enjoyed checking out the mechanics of these old tractors! Then of course there were tremendous views of Mt. 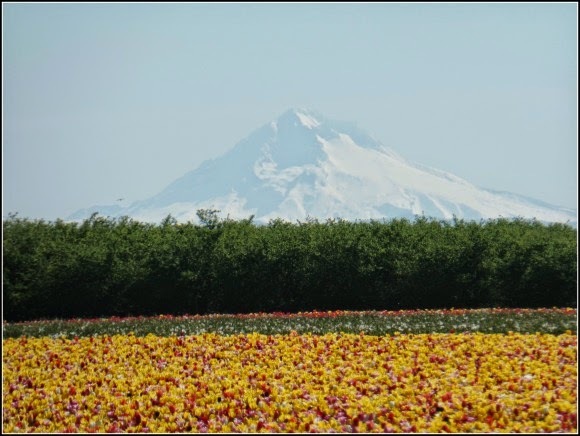 Hood, with the tulips in front, it was a stunning view of the mountain! 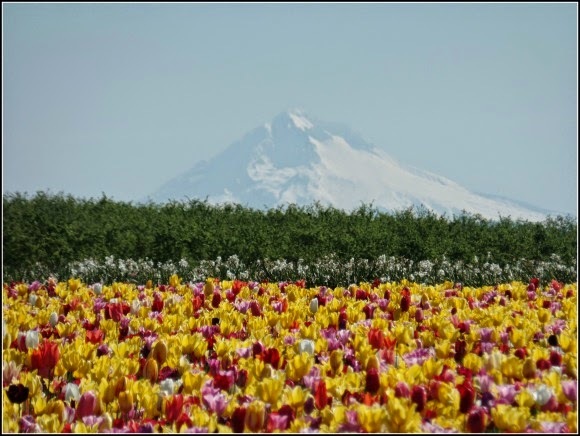 I really enjoyed getting photos of this mountain view, Mt Hood is always very pretty to me, but it was really gorgeous with the tulips in view! We had a wonderful outing, definitely a fun spring outing that I hope to do again! On our way home the sky cleared up and we had beautiful views of Mt. Hood the whole way home, and spotted signs of beautiful spring blossoms, like this field of azaleas, all around. As far as the trip to for the ultrasound, it turns out my back and stomach pain was not just my back acting up, it turns out I have gallbladder issues! I will have to have surgery to remove my gallbladder sometime soon, so I am busy getting all of my garden plans ready to go, and all of my supplies ready so my family can help get my spring garden in if I am still laid up in recovery. I do not like staying down with all this beautiful weather, so I hope my surgery goes well and I heal up fast! I am excited for Earth Day this week, and have an exciting garden project to share about later this week. 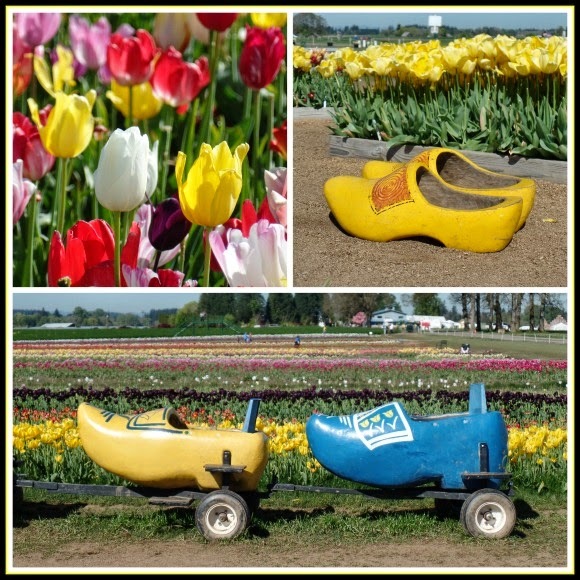 You can read more about The Wooden Shoe Tulip Festival at their website. I hope your gallbladder surgery is quick and easy for you, April. 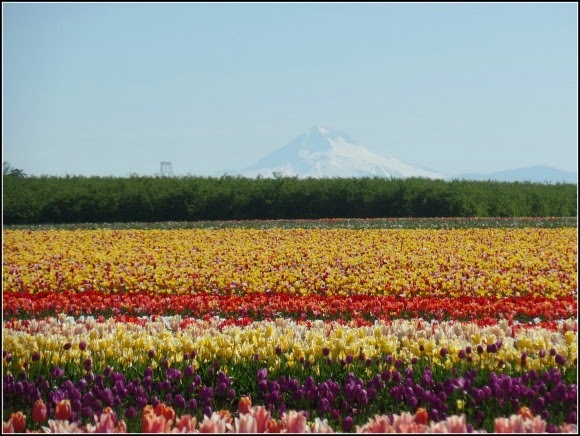 That is one gorgeous setting with the tulips and Mt. Hood! You certainly live in a beautiful area. 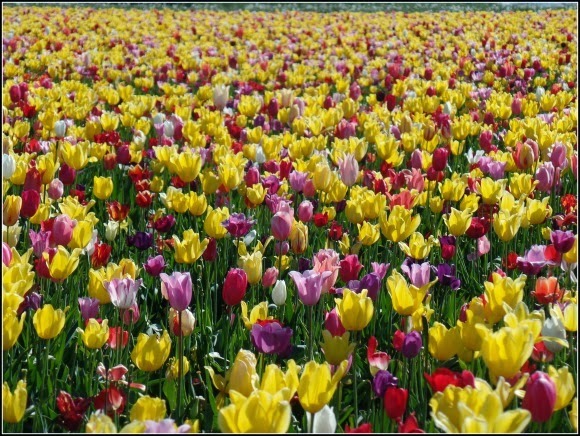 We have a tulip festival in Holland MI here. Haven't gone in ages, but your post makes me want to go this year. 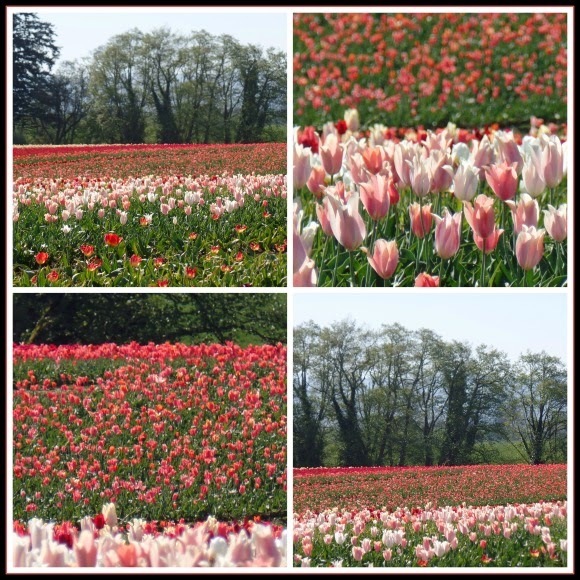 I stumbled onto your blog from a link party and saw these pretty tulip pictures! 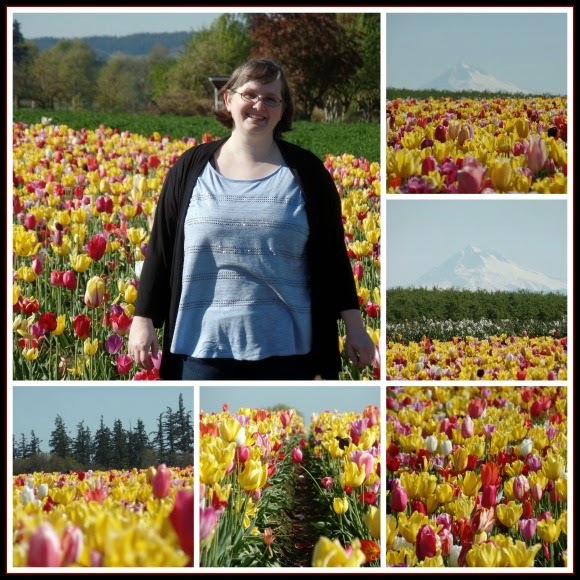 I love going to flower farms... 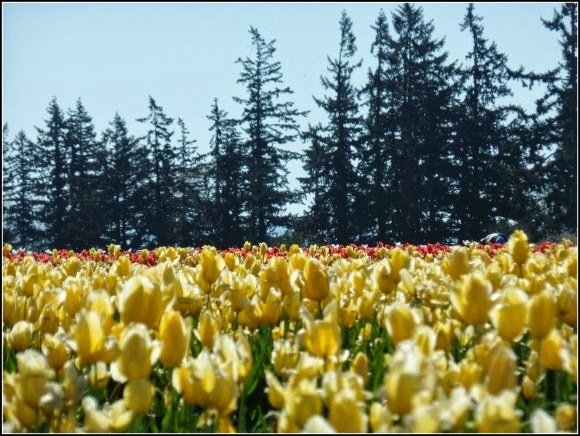 There is nothing like seeing acres and acres of flowers! And how lucky are you, to have all of the mountains out on such a pretty Spring day. I wasn't born yet when Mt. 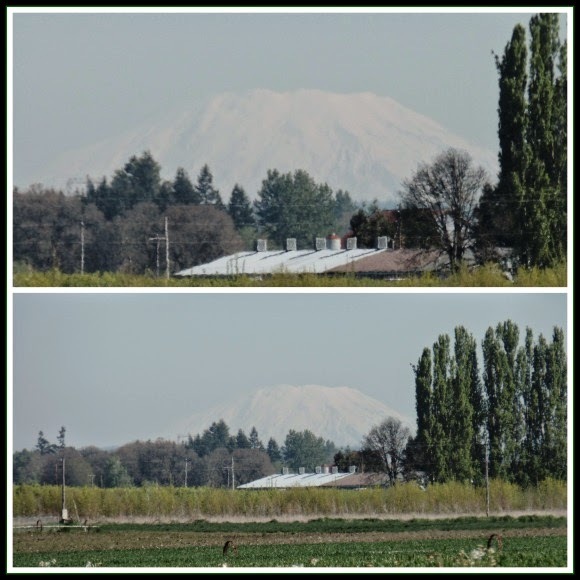 St. Helens erupted but I do remember finding ash in our yard! 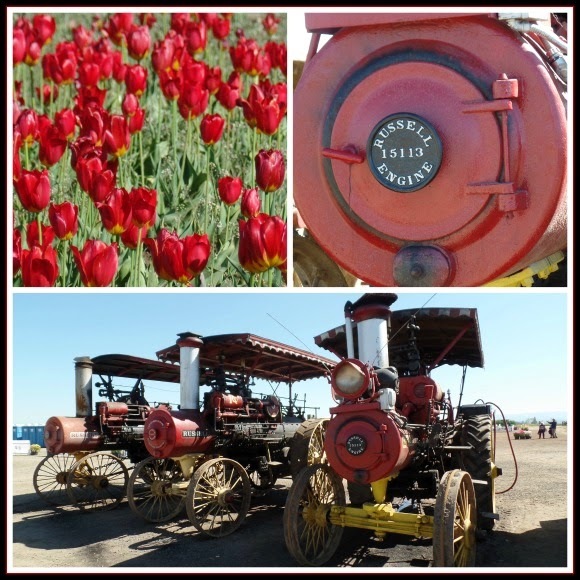 Added you to my blogroll as your NW excursions remind me of my old home!